The beginning of the month is my favorite time. It's a time to look ahead at increasing your dividends, and a time to reflect on the previous month. 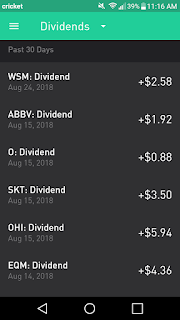 Another month has gone by, which means it's time to examine what the dividend portfolio provided for me in dividends for the month of August. Overall, August was yet another record month for me in terms of dividend income. 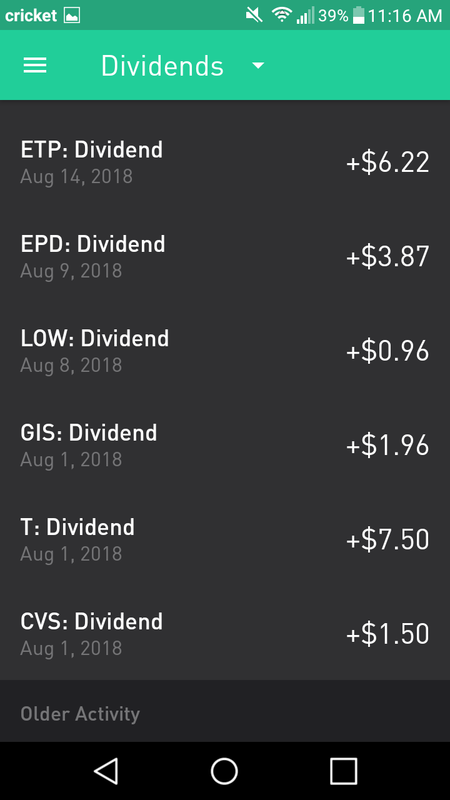 I collected $41.19 in dividends from 12 different companies. When compared to my dividend income for the middle month of the prior quarter in May, my dividend income grew 21.6% from $33.86 to $41.19! This sort of growth is primarily because I am starting from such a small capital base that even a small investment, along with dividend increases and dividend reinvestment have a measurable impact on my dividend income. Let's delve into how my income grew from $33.86 in May to $41.19 in August, shall we? This $7.33 growth in income from May to August can be explained by 3 things. Over the past few months, I've initiated a new position of 4 shares in EQT Midstream Partners LP (EQM) (by selling 3 shares or half my stake in CVS), a new position in Abbvie of 2 shares (ABBV), and a new position in General Mills (GIS) of 4 shares. 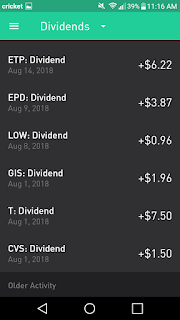 The addition of ABBV increased dividend income by $1.92, the addition of GIS added another $1.96 in dividends, and lastly the substitution of CVS for EQM added $2.86 in dividend income ($4.36 in income from EQM versus the $1.50 of income from CVS that I gave up when I sold my 3 shares). In total, these transactions alone added $6.74 in dividend income. Another $0.43 came from the purchase of 1 more share of Enterprise Products Partners (EPD). The final $0.16 in additional income was a result of the dividend raise from Lowe's (LOW) from $0.41/share quarterly to $0.49/share manifesting itself as I own 2 shares. The great thing about this is that my dividend income in November will be even higher without any additional effort on my part. I recently added to my stake in Abbvie, so that will add another $0.96 in quarterly dividends alone. This doesn't take into consideration any possible dividend increases that will occur among my holdings by November. For instance, EQM has a trend of raising its distributions on a quarterly basis, and I expect this to be no different for the next distribution. Although I won't be able to contribute any new capital to the account that could possibly increase my dividend income for the middle month of the quarter, I will continue to pool my dividends and selectively reinvest into an existing holding. I'm not sure whether it will be a holding that has paid me dividends during this month, or a holding from a different month because I don't know what opportunities Mr. Market will present to me in a couple months. I will, however, continue to contribute to my retirement plan through my employer which will be a nice boost to my end of quarter month income. How was your August? Did you get any dividends from new names in your portfolio or is your portfolio pretty well established already? What was your quarter over quarter dividend growth from May to August? Well done Kody, it is great to see those new records! 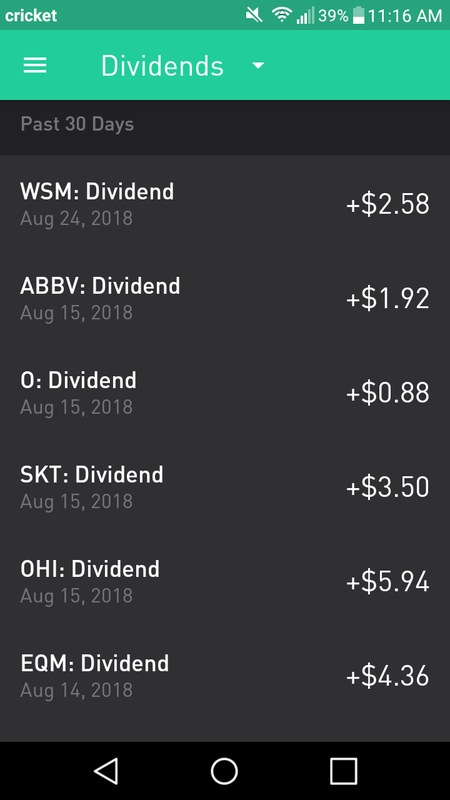 ABBV has been very good to me as I've been holding since the spin-off from ABT, and I hope it does well for you too. Keep up the great work and you'll be seeing new records on a consistent basis! Thanks, DD! You had quite an August with your portfolio. That raise from Altria was amazing for both of us! Keep on pushing and deploying capital! Good job, keep adding it will grow. we share GIS, T, OHI, and OKeep it up. D&H, you had a very impressive month with your dividend income. A 70% increase in dividends from last year is incredible, especially considering the capital base you're working with. Keep it up! I look forward to following your journey. Very nice month Kody! And congrats on the personal record there. Thanks! You had a great month of August as well, adding/acquiring shares in 3 quality companies. My September will also be a bit better than my August as I'll be receiving dividends from my retirement account holdings in about a week. Thanks, Bert! The feeling is mutual. It's been great to follow your stories over at DD as it shows me what the later stages of DGI look like.